The holidays are a time of year that are almost inevitably followed by a feeling that you should be more active after all those treats and large meals. Many educators want their students to be more active and engaged, but like the post-holiday feeling that you should be more active, it is hard to turn that good will into consistent action in your instruction. This post focuses on easy changes to make your course more active. Active learning is time in your classroom when students are actively thinking, talking, and making sense of ideas. It is contrasted with passive learning, when students are being receptive (listening, note taking, etc.) An individual class is typically considered active when 60% or more of the time is students thinking and talking, rather than the instructor explaining. To get started with active learning, identify a key or threshold concept (Meyer and Land, 2003) that students need to understand well and use often, but seem to struggle with. That’s a great place to focus on active learning, because active learning processes make it more likely your students will be able to retain and apply what they have learned. Before you make any type of change, you often need to consider possible options. Start will some videos or browse some resources and think about the strategies that might fit well given your content and discipline. It is essential that the specific strategy fit the concept you need student to make sense of, so you can’t just pick one at random. For threshold concepts, strategies like error analysis, concept formation/concept attainment etc. are often the most effective. If you’d like someone to help you consider some options best suited to you, but you don’t want to wade through the options, make a short appointment with Gwenna Moss. We’ll suggest some great options given what you explain about the concept that you are teaching and the size of your class. Start by really clarifying how the process will work in your own mind. Identify what you’ll still need to teach directly so students have enough knowledge to do the active task. Choose a class you are comfortable in, and explain how important the concept is and why you’ll be using an active strategy. If you haven’t used the particular strategy you are trying, explain the process and what behavior you’ll expect explicitly. Use the strategy, circulating to help or prompt students often. Once you are done with the activity, summarize the key takeaways and implications with your students. Next time this key concept comes up, refer back to the activity and the lessons learned. You use the summarizing and references to prior learning to ensure students are connecting the learning well, and didn’t miss anything essential. I am a member of a committee which is exploring whether there are teaching practices that support student mental wellbeing in the classroom. You are probably thinking that this means talking about mental health directly with students. That’s not what we are interested in. Instead, we want to find out how instructors can create a classroom environment that is more conducive to student mental wellbeing. There has been some research in this area but it is a relatively new approach. In the few studies that have been published, several teaching strategies have been reported to improve student mental health. One of these factors is creating a sense of belonging and connectedness in students by promoting the development of positive relationships with fellow classmates, instructors and the university as a whole. I would like to tell you about something that I am trying this term to accomplish this. This idea originated with Glorie Tebbutt who is a sessional lecture, teaching first year classes in English and Women’s and Gender Studies. I sat down with her one afternoon to discuss her take on effective teaching practices for student mental wellbeing. She gave me some amazing ideas that she has used in her own classes, including the one I am trying out. She contacts her students several weeks before the start of class and requests a selfie plus something they would like to share about themselves. She also asks two questions: 1) What do you need from me to be successful in class and 2) What do you need from each other to be successful in class. I thought this would be a great way of achieving the goal of building connectedness, even before students arrive at the U of S so I decided to try it in my own first year class. I teach ANBI 110: Introduction to Animal Bioscience. The class has 67 students this year; over 90% are female and most of them are interested in becoming veterinarians. They know they will need excellent grades to be accepted into the vet med program so they are already under a great amount of self-imposed stress. It is also the only course they take that is delivered by our department in the first term. It is our one opportunity to connect students with our department and make them feel that they have an academic home. With these things in mind, I emailed this to the ANBI 110 students. I am Murray Drew and I will be one of your instructors for ANBI 110: Introductory Animal Bioscience. I teach the laboratory component of the course and this is my favourite teaching activity. My main goal in sending you this email, before classes even start, is to find out more about you and what you need to be successful in my course, and at the U of S. I also want to build a community and help you feel connected to your classmates and instructors. One of the best things that you can do to be successful and happy at the U of S is to develop relationships with your classmates and professors. I want to start that before you even get here. First, please send me: 1) your name and a picture of yourself (with an animal if possible), 2) one interesting thing about yourself, 3) what you want to achieve at the U of S and 4) what you need from me to be successful. My email address is (address provided). Here’s an example of what I’m looking for. 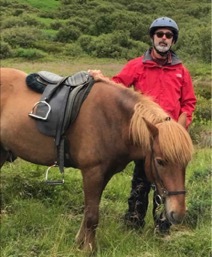 This summer I went to Iceland and rode an Icelandic horse on a tour through a lava field. I am the world’s 2nd worst rider. I want inspire students to love animal science and get them involved with animal research. This is what I need from you. I need you to participate in class. Ask questions, challenge me, interact with your classmates. Take control of your education. Second, please join the class Facebook page that I have set up. I hope to use this to stimulate a few conversations about the course. The group’s name is Animal Bioscience 110 for 2018. Thanks for doing this. I look forward to seeing you next month. In the week since I sent this, I have had 32 responses. Very thoughtful responses. Most students said that making myself available if they were having trouble with course material was very important to them. Some mentioned that they had ADHD or suffered from anxiety and that they hoped I would be understanding if they were having difficulty. Virtually all of them ended their email thanking me for contacting them and said it helped them feel a little less stressed about starting classes. I also have a class Facebook group and most students have joined it. I have posted a few questions and hope this will start some discussions and get students interacting with each other. Of course, I know that doing this isn’t always going to be feasible. It would be almost impossible to do in classes with hundreds of students. ANBI 110, however, is a special case where this practice is workable. But, it remains to be seen if this will have a significantly beneficial effect on students. I’ll have to see what happens once the students get here. 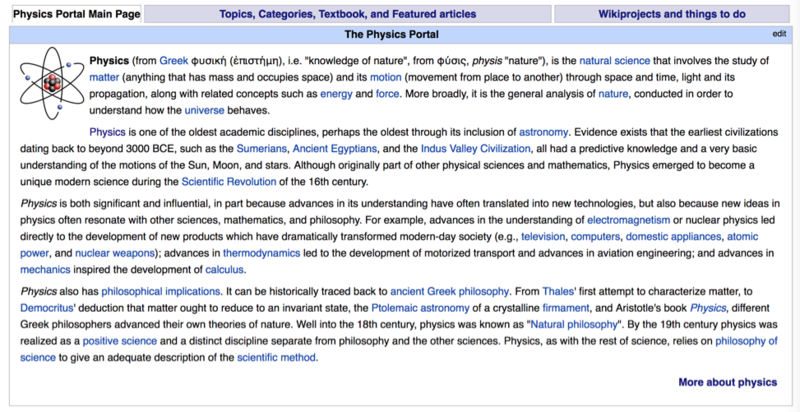 In this blog, I pull together several of the concepts discussed in previous posts, such as Portals and WikiProjects, and consider how you can begin to develop course materials and assignments for a Wikipedia-based course. Let’s say, for example, that you are teaching a physics course and want to assign students the job of editing or writing physics-related articles. A good place to start, for both student and instructor, is the Physics portal, which briefly reviews the field and links to the main article on Physics (see excerpt below). It also has a tab entitled “Topics, Categories, Textbook, and Featured articles,” which links to Wikipedia articles on classical physics, modern physics and cross-disciplinary topics, as well as a “textbook” that slots Wikipedia physics articles under chapter headings. While the textbook remains a work in progress, it is a more efficient way to gauge Wikipedia’s coverage (or lack thereof) than simply using the Wikipedia search engine. Apart from the main Physics portal, other relevant portals might include Astronomy, Cosmology, Electromagnetism, Gravitation, and Science. The third tab on the Physics portal page is “WikiProjects and things to do,” which I turn to next. The Physics portal lists four WikiProjects and task groups: WikiProject Physics, WikiProject Space, WikiProject Time, and WikiProject Cosmology. 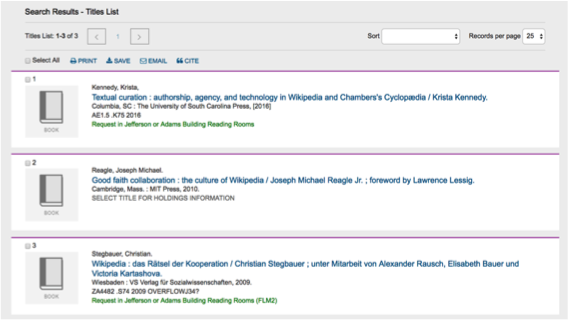 WikiProjects are valuable both to the quality of Wikipedia and to instructors; for an explanation, see my two-part blog, “WikiProjects, Article Importance, and Article Quality: An Intimate Relation­ship” (http://bit.ly/2l8fSEa and http://bit.ly/2lH9hjJ). 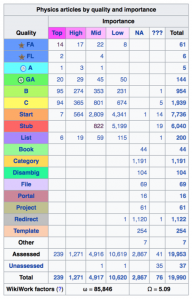 One of the key things that a Wiki­Project does is rank Wikipedia articles for importance and quality on a two-dimensional grid. For example, shown here is the grid from WikiProject Physics (screen shot of 27 May 2017, linked to the current version). I’ve selected 822, which is the number of stub-class articles of mid-importance to WikiProject Physics, a list of which can be accessed by clicking on the number. Stub-class articles can be a good starting point for student projects, though start-class articles are also good. An example of a start-class article that is also considered to be of top importance (of the seven in this category) is Classical physics. It is a good idea for students to become familiar with the different categories of importance and quality in Wikipedia articles, so they know what to strive for and how things can be improved. For example, it would be instructive for them to review at least a couple of the project’s 61 Featured articles, one of the six List articles, a few of the 144 Good articles, and a smattering of the remaining categories. Reading the Talk pages associated with these articles and looking at their View History pages is also a good introduction to the kinds of issues that student editors might face. See, for example, the “Classical physics” Talk page. Instructors should also take a close look at the Wikipedia Education Program, set up through the Wiki Ed Foundation to support instructors and students. Help ranges from accessing brochures to training to designing and implementing a 12-week course with Wiki Ed support and an instructor dashboard. The dashboard is a powerful resource that lets you see what aspects of the training that students have completed, as well as all articles or other projects they are working on. You can get started at the main page for educators and proceed to various pages, such as the one that provides case studies of assignments and grading. Let’s consider an example of a Wiki Ed course, this time from the life sciences. The course is “Molecular Genetics” and the main course page shows that it was taught this spring by Eric Guisbert of the Florida Institute of Technology, with assistance from Wiki Ed’s Ian Ramjohn. Clicking on the Dashboard link takes you to the details for the course; the header excerpt, linked to the Dashboard, is shown below. This header, and further information found by clicking on its links (Timeline, Students, Articles, etc.) show that of the 27 students who registered for the Wikipedia option, 23 completed the training, and that this cohort edited 55 articles and created three new ones—about 1100 edits comprising some 31,400 words. The articles were viewed by Wikipedia users about 1.7 million times during the course, which provides a sense of the real-world impact—positive or negative—that student editors can have. Let’s look at the work of one student with username Ncameron2013 (accessed via the “Students” link). Ncameron2013 was assigned (or chose) the article “Receptor Tyrosine Kinase” to edit and was also assigned (or chose) three other articles for peer review—that is, the student was tasked with reviewing and commenting on the work of the three student editors for those articles. We can find out what Ncameron2013 did by clicking on the dropdown arrow on the right. The resulting screen shows that after completing the training modules and preliminary assignments, Ncameron2013 was active, first in the Sandbox, commenting on the work of LBates2008 and Cbyrd2011 and creating a new section of the article entitled “Regulation” (March 12–15); then working on the article live from March 15–16. (See below.) Clicking on the “Show” button for any of these entries allows us to see the work that Ncameron2013 did on these occasions. This feature is helpful in giving an instructor a precise understanding of a student’s contribution to article development; it is especially useful in the event that another Wikipedian edits or deletes the student’s work (as has happened more than once with my students). I hope that these blog posts have provided greater insight on how you can use Wikipedia assignments to help your students make the leap from consuming knowledge to creating it. From here, my recommendation is to “just do it” and learn how to adapt all of this to your own context. And if you’re excited about getting more involved, consider attending the annual international Wikimania conference, being held this summer in Montreal. Conference themes include the contributions of academic and cultural institutions within the Wikipedia movement, privacy and rights, and the role of technology in disseminating free knowledge. As for me, this will be my last blog post in this series before I take up my new position next month. I thank the Gwenna Moss Centre for Teaching and Learning for giving me this forum to share my thoughts, and invite you to stay in touch with your stories about the use of Wikipedia in higher education. John Kleefeld is an associate professor at the College of Law, a 2017 teaching fellow at the Gwenna Moss Centre for Teaching Effectiveness, and incoming dean of law at the University of New Brunswick. Portions of this blog series are from an article that he and a former law student wrote about using a Wikipedia assignment for class credit. See J. Kleefeld and K. Rattray, 2016. “Write a Wikipedia Article for Law School Credit—Really?” Journal of Legal Education, 65:3, 597-621. Hyperlinks in this grid direct to an external site, Wikimedia Labs. The link for the first 1000 entries in the stub-class, mid-importance category (that is, the intersection of these two ratings) is https://tools.wmflabs.org/enwp10/cgi-bin/list2.fcgi?run=yes&projecta=Physics&namespace=&pagename=&quality=Stub-Class&importance=Mid-Class&score=&limit=1000&offset=1&sorta=Importance&sortb=Quality. However, each of these categories has an equivalent article in Wikipedia itself; here, the relevant article link is https://en.wikipedia.org/wiki/Category:Stub-Class_physics_articles_of_Mid-importance. See https://tools.wmflabs.org/enwp10/cgi-bin/list2.fcgi?run=yes&projecta=Physics&quality=FL-Class (see especially the Featured List article, https://en.wikipedia.org/wiki/List_of_Nobel_laureates_in_Physics). This is a former Featured article, which means that the quality has slipped over time (see the articles’ Talk page). See https://dashboard.wikiedu.org/courses/Florida_Institute_of_Technology/Molecular_Genetics_(Spring_2017)/timeline. See also the thorough set of assignments there, designed to gradually bring students up to speed on Wikipedia conventions and editing practices. Times shown here are Coordinated Universal Time (UTC), closely related to Greenwich Mean Time (GMT), and used by Wikipedia to keep track of edits. 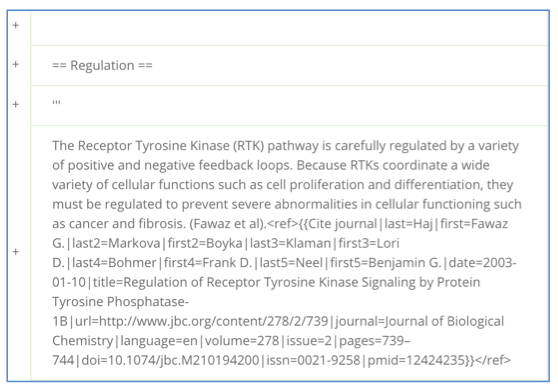 For the “diff” comparison between former and revised versions, see: https://en.wikipedia.org/w/index.php?title=Receptor_tyrosine_kinase&type=revision&diff=770669168&oldid=768683561. In the first part of this two-part piece, I discussed arborescent (vertical, discrete, hierarchical) and rhizomatic (horizontal, overlapping, interconnected) ways of acquiring and classifying knowledge, as well as the convergence of the arbor and the rhizome in modern knowledge systems. In this part, I discuss how this applies to Wikipedia. Most of us use the Web rhizomatically: we enter a search term in Google or Wikipedia, look at the search results, and follow the links, whether to other Wikipedia pages or other online or offline resources. As I said in the previous post, this lets us explore pathways that interest us most, and may also lead to more engaged learning. But this approach can be both over-inclusive, requiring us to sift through a lot of information before getting to what we need the most, and under-inclusive, in that we can miss relevant material that requires different search terms than the ones we used for searching. Fortunately, Wikipedia provides a number of ways for accessing knowledge that makes it a more powerful encyclopedia than it would be if you had to rely on the search engine alone. The first of these is Portals, which in turn direct you to Categories. A teaser is found on Wikipedia’s home page, which has links to eight named portals as well as a link to all of them (see linked screen shot below). The Biography portal reveals that biographies are categorized in various ways (e.g., by association, ethnicity, gender, nationality or occupation). Thus, using this method, you could find, for example, a linked list of all Wikipedia biographies on signatories of important documents (an association category), which in turn leads to a subcategory of Signatories of declarations of independence. The most famous of these is the United States Declaration of Independence, and a further subcategory links to the Wikipedia articles on all 56 signatories of that document. These articles are also listed in the Wikipedia page Signing of the United States Declaration of Independence, showing that there is often more than one path to an information source on Wikipedia. There are currently 1491 portals on English Wikipedia, with one of these portals being an alphabetical index to all 5.4 million Wikipedia articles from Aa (you might be surprised to know how many rivers are named “Aa”) to ZZ (a scale used in model railroading). When it comes to categories, there is also an alphabetical index to all categories, though given the many thousands of categories, it may be more useful to access the topical category index, which organizes categories under 12 broad headings and provides a separate search engine just for categories (see linked screen shot below). I tested this by searching for a highly topical subject—cybercrime. The results show that this is a named category (https://en.wikipedia.org/wiki/Category:Cybercrime, the standard syntax for categories in Wikipedia). The results list a number of other related categories, such as Cyberwarfare and Cybercrime by country, several of which may be relevant to writing or editing a Wikipedia article. The Cybercrime category in turn currently has 20 subcategories and 123 pages, and the subcategories also have subcategories and pages of their own. Using this approach, I quickly found, for example, the recently created article on the WannaCry cyberattack, reported to have affected more than 230,000 computers in over 150 countries in May 2017. The above approach proceeds from the general to the particular in a branching or arborescent fashion (though I could have started at an even higher level of generality—Crime by type). The point I want to make, though, is that you can also discover this structure by going from the particular to the general. For example, if I use Wikipedia’s basic search engine and type in “WannaCry,” I get the article on the WannaCry cyberattack; then, scrolling to the bottom of the article, I find lots of related information, including links to six portals; a template for the category Hacking in the 2010s, showing a timeline with major incidents, groups and vulnerabilities; and links to several other related categories, from “2017 in computer science” to “Ransomware.” From here, I can switch modes and proceed rhizomatically to other topics, while still being able to see the overall structures within which they are organized. In other words, Wikipedia lends itself to a high degree of convergence of both arbor and rhizome. Wikipedia provides other methods of organization besides portals and categories, including third-party systems such as the Library of Congress Classification (LCC) system that I mused about previously (see below). While the LCC system has been criticized as being more a guide to the books in a library’s collection than a classification of the world’s knowledge, it is well developed and in use by many academic and research libraries. Its 21 classes are further subdivided into a large number of two- or three-letter subclasses that are listed on the LCC page, with, in many cases, links to their own pages. For example, subclass AE – Encyclopedias, mentioned in my last post, has its own Wikipedia entry. Many of these are important subject articles in their own right. 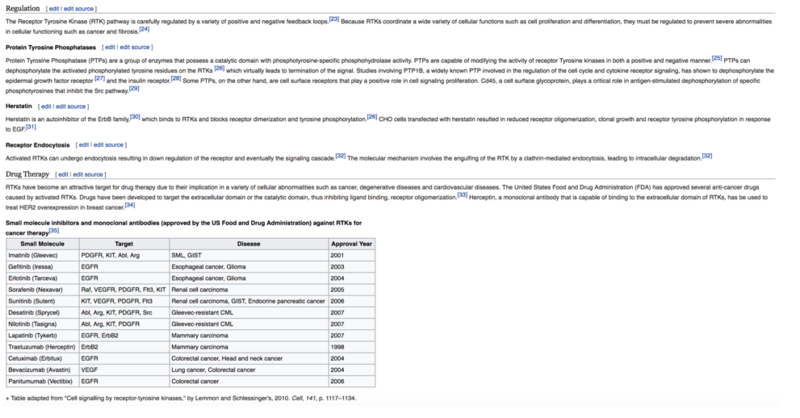 For example, RB – Pathology, a subclass of class R – Medicine, links to the Wikipedia article on Pathology, considered of high importance to WikiProject Medicine and currently rated B-class on the project’s quality scale. (On these rating systems, see my blog posts from February 14 and February 28.) Thus for a researcher already familiar with the LCC system (or a component of it such as, in my case, subclass K – Law), Wikipedia offers a way to translate that familiarity and move easily from browsing a library shelf to browsing an online encyclopedia. In my next post, I’ll bring together a number of concepts that I’ve been writing about. Specifically, I’ll tell you how you can work with Portals, WikiProjects, and the Wiki Ed program to create a course that incorporates Wikipedia assignments and that uses the Wiki Ed dashboard to keep track of student work. John Kleefeld is an associate professor at the College of Law and a 2017 teaching fellow at the Gwenna Moss Centre for Teaching Effectiveness, where he is coordinating a campus-wide project on integrating Wikipedia assignments into course materials. Portions of this blog series are from an article that he and a former law student wrote about using a Wikipedia assignment for class credit. See J. Kleefeld and K. Rattray, 2016. “Write a Wikipedia Article for Law School Credit—Really?” Journal of Legal Education, 65:3, 597-621. In my previous post, I characterized the subject categories in the Requested articles page as idiosyncratic and mused that they might be better based on the Library of Congress Classification system. As it happens, Wikipedia does map some of its articles (pages) into the LCC system, and also provides several other methods of organizing knowledge. Some of these are well known, some less so. I want to discuss them because I think that instructors and students alike should be familiar with ways of finding knowledge beyond today’s default method of keyword searching. First, though, I want to talk about two approaches to knowing or learning, which philosophers Gilles Deleuze and Félix Guattari termed arborescent and rhizomatic in their 1980 book, A Thousand Plateaus. I will then consider how these approaches are converging in web-based retrieval systems, including Wikipedia. The word arborescent is Latinate for treelike. Tree diagrams, also called dendograms (Greek: dendro, tree + gramma, drawing) have depicted genealogical relationships (“family trees”) since medieval times; the “tree of life” or variants on it have been used at least since Carl Linnaeus classified relationships among organisms; and the ubiquitous “org chart” is a kind of inverted tree. Arborescent ways of knowing are said to emphasize totalizing principles (the notion that universal facts can be discovered and classified), binary opposition (e.g., male-female; predator-prey), and relationships characterized by discrete branching hierarchies rather than horizontal interconnections. The rhizome is also a botanical metaphor. A rhizome (Greek: “mass of roots”) is a stemlike root lying on or just below the soil surface and having the ability to send roots and shoots from its nodes. Think of ginger, ginseng, and many grasses. The concept allows for multiple, non-hierarchical entry and exit points, with one thing potentially networked with many other things, sometimes in unpredictable ways. Ecosystems, power grids, and Web 2.0 are quintessentially rhizomatic systems. And Wikipedia is a quintessentially a Web 2.0 phenomenon, in allowing users to collaboratively create knowledge with multiple jumping-in and jumping-off points based on hyperlinked text and images. Having identified the differences, I don’t want to convey the impression that rhizomatic ways of knowing are either entirely new or necessarily superior to arborescent ways. As to newness, consider the dictionary, which, even before the 1755 publication of Samuel Johnston’s opus, came to be organized alphabetically rather than topically. This form of organization, which must at first have seemed arbitrary compared to its forebears, turns out to be surprisingly rhizomatic: I can open a dictionary at any page, read a word’s definition, and be led to another word and its definition through an italicized or bolded word in the definition. The idea is so powerful that it stuck: with today’s dictionary apps, you jump to the new word by clicking on it instead of turning pages. Consider also the polymath—a distinctly rhizomatous type of scholar. An early example was Aristotle, whose knowledge spanned physics, metaphysics, poetry, theatre, music, logic, rhetoric, politics, ethics, and biology. In a similar vein, Hildegard of Bingen was an abbess, writer, composer, philosopher, musician, mystic and medical writer. Leonardo da Vinci not only created the world’s most famous painting but is also credited with inventing the parachute, helicopter and tank. Erasmus Darwin, physician, poet and propounder of the evolutionary theory more rigorously developed by his grandson, penned a 4,400-line treatise that straddled all branches of science and technology and used a whimsical rhyming couplet structure footnoted with his scientific observations. Though polymaths are at risk of becoming an endangered species, recent interest in interdisciplinary studies may yet save them and their rhizomatic tendencies. As to superiority, rhizomatic approaches let people access material in ways that are most intuitive for them and explore the links and pathways that interest them most. But while this can lead to more engaged learning, it can also be inefficient and leave knowledge gaps that more structured approaches would avoid. In other words, it can be both over- and under-inclusive. I’ll illustrate this with an example from my own discipline, law—specifically, the “implied undertaking” rule in litigation. Litigating parties have “discovery rights,” an aspect of which is that they can get copies of each other’s documents that are relevant to the litigation. In Canada, such rights are generally accompanied by an implied undertaking not to use the documents for a purpose outside the litigation (also framed as “collateral or ulterior” to the litigation). Suppose, for example, a dismissed employee sues her employer, a company, for wrongful dismissal. Through the discovery process, she obtains a report that one of the company’s officials made to a government ministry, with comments that criticize the former employee’s ethical conduct. She then starts a new lawsuit against the company official for defamation. If the lawsuit is based solely on the report obtained in the wrongful dismissal action, it will likely constitute a breach of the implied undertaking rule and be unsuccessful. I say “likely” because the rule’s scope is subject to interpretation, may be overlaid with other court rules specific to a particular province, and may be subject to exceptions or court procedures in which a party can seek to be relieved of the undertaking. Suppose I want to learn more about the rule. One way is to enter “implied undertaking” into a search tool like CanLII’s public-domain search engine or Westlaw’s proprietary product (available free with a U of S library account). This approach generates useful information—in the form of hundreds of case reports decided by judges. On skimming the cases, it becomes apparent that they are weighted according to relevance, which, in a mechanistic attempt at modelling human reasoning, means that they are ordered by the number of times the term “implied undertaking” comes up. This is neither a reliable nor an efficient way to learn about the scope of the rule or its exceptions, and even if I apply filters (for example, isolating the search to cases only in a certain province, or only at appeal-level courts), I am still likely to have to sort through dozens—perhaps hundreds—of cases. Even then, I will likely miss a lot of material because other terms are also used to refer to the concept, such as “deemed undertaking” or “undertaking as to confidentiality.” Isn’t there a better way to get an overview of the subject? Yes, and it’s arborescent. That way is an encyclopedia article, in this case, from the Canadian Encyclopedic Digest (CED), another Westlaw product. One of the ways of accessing its material is through an alphabetically ordered, branching, hyperlinked table of contents. This requires some thinking about how the subject matter might be organized. After a bit of trial and error, the title “Discovery” seems an option. It has two headings, one for Ontario and one for the Western provinces. Scanning through the topics under either of these headings leads to the subheading for the article on the rule, as can be seen below (omitted subjects marked with an ellipsis). Clicking on the subheading pulls up an 11-paragraph article that succinctly outlines the rule and how it works, footnoted with a couple of dozen cases for those who want to drill down to get more information. This still leaves me with a fair bit of reading to do, but not nearly as much as by following the purely rhizomatic approach. In fact, the story I have just told is oversimplified, because it doesn’t explain how in modern knowledge systems, rhizomatic and arborescent approaches are evolving towards convergence. For example, the “Implied or Deemed Undertaking” article in the CED also has a paragraph that links to headings in the Canadian Abridgment Digests, which cover cases on the rule from across Canada in digest (condensed) form. Further, even if I had only used my simple keyword search, “implied undertaking,” I could have arrived at the digest list through the first case on my search results by clicking on a sidebar headed “Related Resources.” Unfortunately, this list does not link back to the CED article on the topic, indicating that convergence is still a work in progress. But armed with the new information of a subject entitled “implied or deemed undertaking,” I can use that as a phrase in the CED search engine to find the encyclopedic article of the same name. Other systems work in similar ways, with varying degrees of convergence. 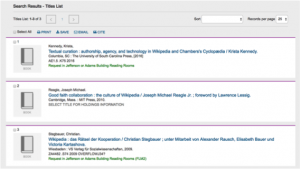 An example of a highly convergent system—one that allows for multiple searching approaches that are cross-linked to each other—is the Library of Congress Online Catalog. Its main web page allows you to choose from three searching methods: Browse, Advanced Search, and Keyword Search. Let’s suppose I want to look for books about collaboration in Wikipedia. 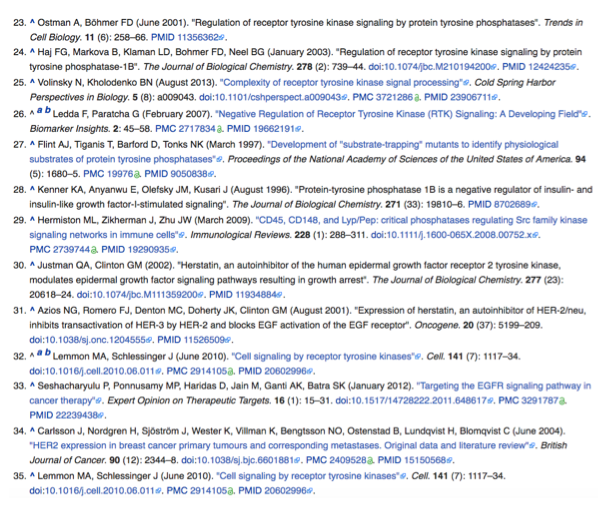 I might start with something as simple as a Browse for subjects containing “Wikipedia” (see below). Those titles may be enough to satisfy me, but I won’t have done a very thorough job of researching if I don’t also look at the information below the book title. The first thing I notice is that two books have different Library of Congress (LC) classification numbers. The first starts with AE100. LC Class A is “General Works,” and subclass AE is “Encyclopedias.” The second starts with ZA4482. LC Class Z is “Bibliography, Library Science” and subclass ZA is Information resources/materials. Thus similar-sounding material may be indexed under different numbers—in the one case, the focus is more on encyclopedias and in the other more on user-generated knowledge—but the LC system allows me to search on both those numbers to expand the search pie. I can do that simply by clicking on the number beside “LC classification (partial)” or by searching for it as a call number in the Browse feature (see below). If I do that, about 15 records come up for AE100 (followed by higher-numbered records; as the name implies, this feature is similar to browsing books on a shelf). If I do the same thing for ZA4482, about 20 records come up. I have now expanded my search results from 24 to 35 potentially relevant records. 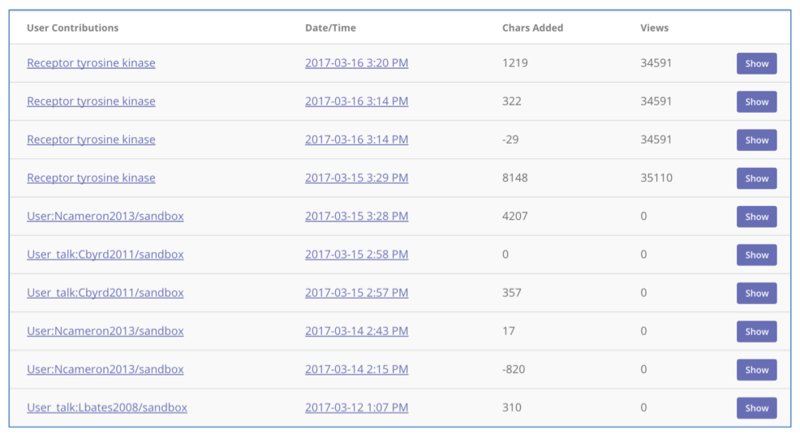 If searching by call number seems too geeky to you, a different option presents itself in the form of related subject headings. There are six of these for the Good Faith book and five for the Global Wikipedia book, with an overlap in the first subject heading, “Wikipedia.” All of these are hyperlinked and take me to the subject listings in the LC catalog. For instance, if I click on the subject heading “Authorship–Collaboration–Case studies” under the record for the Good Faith book, I get three further entries, including one German book that falls in the ZA4482 class and a book on textual curation that falls in the AE1 class. In my next post, I will show how Wikipedia uses the LCC system as well as several other organizational systems that allow for the convergence of both arborescent and rhizomatic ways of knowing. I am indebted to a colleague, Heather Jensen, for the following example. See Goodman v Rossi (1995), 24 OR (3d) 359 (CA), 1995 CanLII 1888. CIV.XII.1.d Deemed or implied undertaking (153). Clicking on the last of these headings leads me to the digests, sorted in reverse date order.